Isn’t it cool? 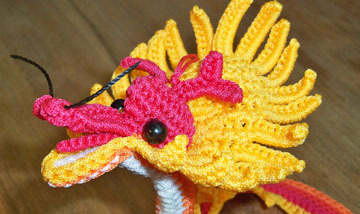 It’s a Chinese Dragon! And it’s crocheted!!! I LOVE it!!! It has nostrils, a tongue, eyes, feet, and more (I don’t know all the parts of a dragon, so I’m at a loss as to what to call everything on it). His body is bendable with some sort of wire down the middle. It’s hard to tell exactly what kind of wire was used because it’s encased in crochet stitches (it looks green and might be some sort of thick floral wire). The head easily rotates so he can see everything that’s going on in the room! There is a hanging cord so I can hang it, if I desire. But for now, he’s sitting next to me and looking very inquisitive!!! Judging from the shine of the yarn/thread that was used, I’d say he’s made out of nylon. I love the colors that he’s made of and the cute look on his face! What do you think? Isn’t he cute? I already posted a couple of photos of him on my Facebook page and a few people asked me for the pattern. I had to explain that I didn’t design him and he came from China. I don’t have the pattern for him, but if I had the time and inclination, I could probably write a pattern. However, he may be copyrighted, so I won’t do that. Besides, I have other crochet patterns that I’m working on to bring to you very soon! Stay tuned for more to come! 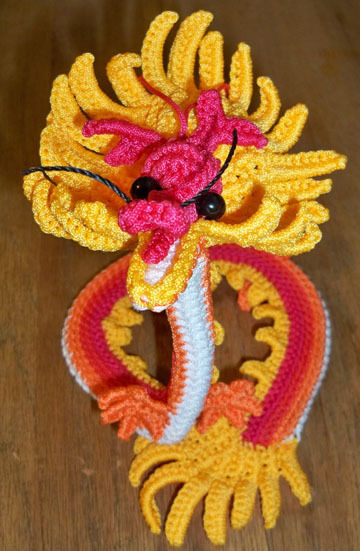 This entry was posted in Crochet Art, Crochet patterns and tagged crochet dragon. Bookmark the permalink.